Ashwin was initiated into music by Sri. Mohan Ayyar and Smt. Sangeetha Ayyar in Sydney. In the US, Ashwin continued his music education under Smt. Hema Sista, disciple of Dr. M.L.Vasanthakumari. He is currently under the tutelage of Smt. Charumathi Ramachandran, the senior most disciple of Dr. M.L.V and recipient of the prestigious Sangitha Kalaimamani title from Govt. of TamilNadu. 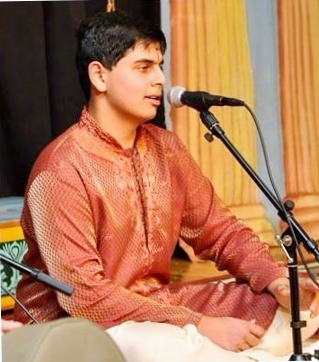 Ashwin has participated and won several awards at the prestigious Cleveland Aradhana including awards in the Advanced Pallavi and the Concert Competition. In the most recent Cleveland festival, he won the Advanced Pallavi competition that earned him a Tambura as a prize. He has been performing in the Chennai Music Festival for the past 2 years in several prestigious Sabhas such as Karthik Fine Arts, Brahma Gana Sabha and Nungambakkam Cultural Academy to name a few. He has also performed in LA, North Carolina, Sydney and in various venues around the Bay Area. Ashwin Srikant is a freshman studying Bioengineeering at UC San Diego, California.